Peter III, son of James the Conqueror, known as “the Great”, came to the throne in 1276. Six years later the people of Sicily revolted against the French who under Charles II of Anjou had invaded their country. In a bloody affair known as the Sicilian Vespers, the French were massacred and the local nobility invited the Aragonese monarch to accept the Crown. Peter III of Aragon accordingly also became King of Sicily. He reigned until 1285 when he was succeeded by his son Alfonso III, who ruled until his death in 1291, at which point the Crown of Aragon passed to another son of Peter III, James II of Aragon. In 1296 the new king granted the crown of Sicily to his brother Frederick, at which stage that monarchy became for a number of years separate from Aragon. James II was followed in 1327 by his son Alfonso IV, who reigned until 1336 when his son Peter IV (“the Ceremonious” or “the Cruel”) ascended the throne. In 1375 Peter attacked and defeated the last King of Majorca and reunited the crown of the island with that of Aragon. In 1381 King Peter IV secured the homage of the Duchy of Athens which had been under Catalan rule since the reign of his kinsman Frederick II of Sicily (1296-1337) whose Catalan mercenaries had captured the area. Peter was followed on his death in 1387 by his son John I, who died without male heirs in 1395, to be succeeded by his brother Martin I (“the Humane”). 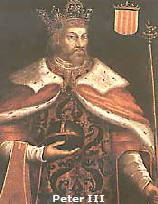 The new monarch’s son, also Martin, had become King of Sicily in 1390 by virtue of his descent from Eleanor of Sicily, the third wife of Peter IV (the male line of the Sicilian kings having died out). Martin of Sicily expired without heir in 1409 and his father took the throne of the island in addition to his existing sovereignty of Aragon. A year later he also died and with this the surviving eldest line of the House of Barcelona became represented by James Count of Urgell, younger son of Alfonso IV. He did not in the event succeed to the Throne of the Lands of Aragon, as was his undoubted right.